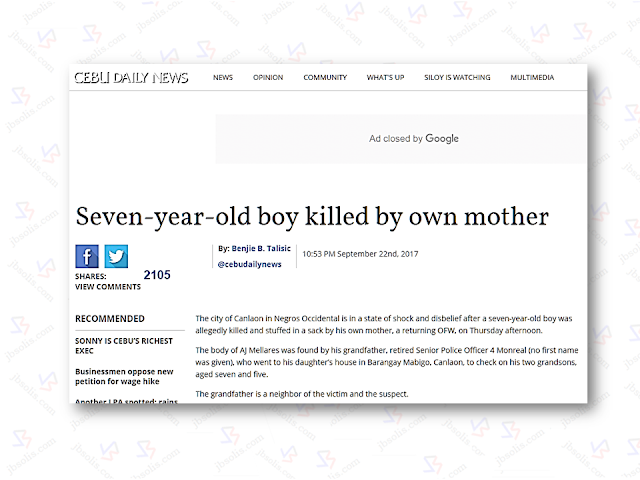 What could a 7 year-old boy could be done that his own mother would kill him? AJ Mellares,7, was found dead by his grandfather at the back of their house inside a sack in Barangay Mabigo, Canlaon City. The suspect, his mother who is a former OFW who arrived barely just 2 months ago. According to PO2 Jonalyn Cubero, chief of the Women and Children’s Protection Desk of Canlaon City, said that around 4:30 p.m. on Thursday, Monreal went to the house of his daughter, Eldrin Ann Mellares, 34, to visit his grandsons. The house is just few blocks away. Upon asking about the whereabouts of his grandsons, the mother told him casually that she killed her son, tied his hands, sacked him and placed at the back of their house, without any signs of panic or remorse. After learning the incident, the grandfather, retired Senior Police Officer 4 Monreal rushed to the place an found the lifeless body of his grandson inside a sack with bruises all over. The grandfather immediately called the police and surrendered his daughter, who is now facing parricide charges for killing his own son. The suspect who has been long separated from her husband worked overseas to support her two kids. She just returned to the country two months ago. Aprobe about the possibility that the OFW has been abused while she was working abroad was proposed by Canlaon City Councilor Valentin Armonio, according to Cebu Daily News report.